Welcome to December Daily® 2017 | Day 17. Today I'm telling the story of the two birthdays our family celebrated this past week by creating pages to go inside the printed star pocket. On top of the "december stories" gold foil tag I added one of the glitter embellishment stars with "17" on top using the white letter stickers from the main kit. On the pocket page I adhered the "let's get festive people" tape I removed from a JCrew box I received in the mail. Inside the pocket I added three printed 5 inch x 7 inch pages that included photos and journaling. I love that the Epson PictureMate PM400 can print the 5 inch x 7 inch size too. I chose to just do one side of these but you could totally add more photos or more words or pattern paper to the back. 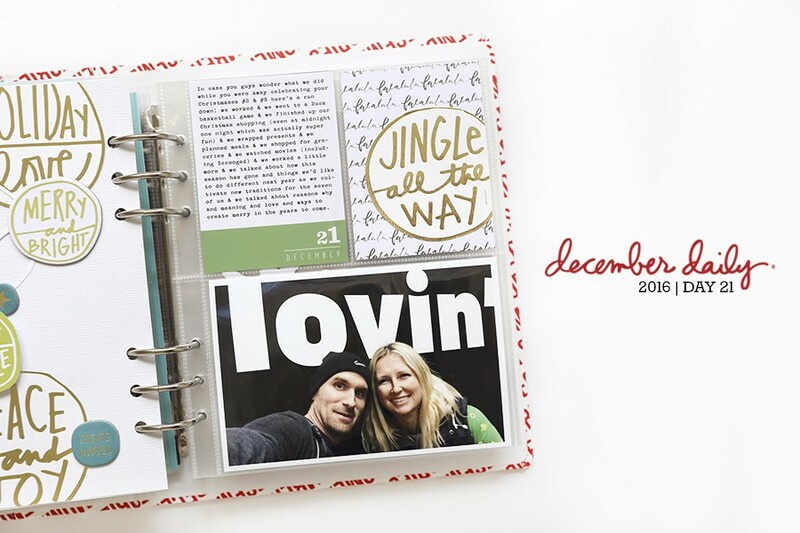 These journaling and photo pages use word art from this year's December Daily® Layered Template Set Vol. 4 and along the top edge I added index tabs. Inside one tab I used one of the perforated word/phrase pieces and I custom printed the other two. 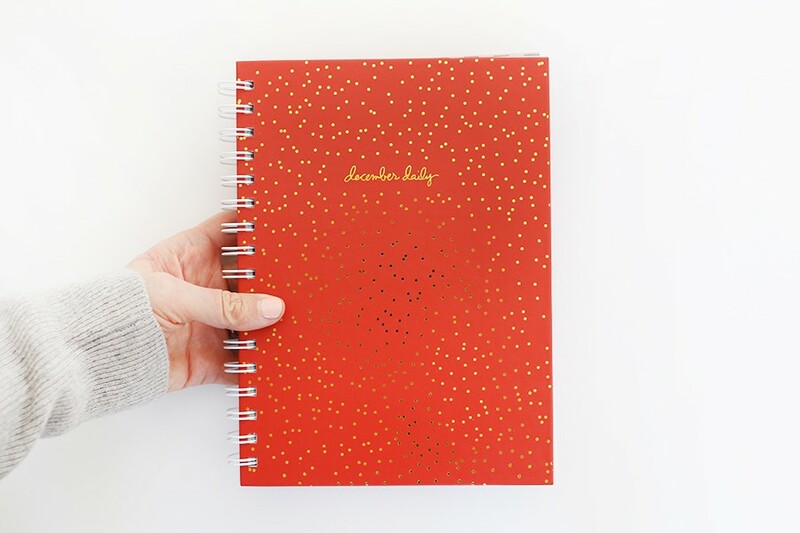 You could do all kinds of fun things with pages this size: create booklets, add more photos, etc. Don't miss out on my 12 Days Of Giving over on Pinterest. Today is Day Six of twelve digital holiday quote downloads. The two pins and downloads are now live and the others will activate over the next few days at 12:01PM EST. All digitals will remain FREE and available for download until 11:59pm ET on 12/31/17. Your daily DD posts are like my own personal advent calendar. Thank you so much! That’s such an awesome way to include more of the story and fill up that pocket page! 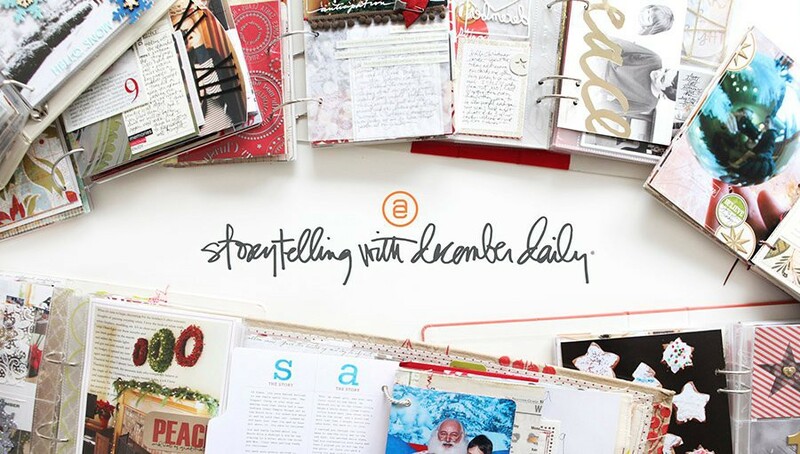 I always love your December Daily posts! Here's a random question that I've been wondering for awhile - how long do prints last that are printed at home? I'm always worried that I will put all this hard work into a book and then it will be faded/discolored in 5 years. Thoughts? I have albums that go back to 2002 and the photos still look fine - and the printing technology at that time was less advanced than it is today. For me, the convenience of printing at home outweighs pretty much everything else. I also come at this from the perspective that it's the process of creating these pages and writing these stories that is really the meaningful piece for me. Most of theme will probably last and some won't and I'm okay with that. Is there a good video on EVERYTHING this Epson PictureMate PM400 can do? Since I'm NOT a technical person I'm looking for the ability to EDIT, PRINT WITH OR WITHOUT A WHITE BORDER & ADD FONT directly to photos using an SD CARD inserted into this PRINTER Ali Edwards uses. It's a real burden and TIME SUCKER running to WALMART to do DECEMBER DAILY. I think I'd be MORE PRESENT & EFFECTIVE if I could just do it at home! HONESTLY, I've been wanting this PRINTER for a couple years, but scared off due to the INVESTMENT $$$ & some of Amazon's BAD REVIEWS!? Hi! You will need either an app on your phone or a program on your computer for editing your photos and adding word art before printing. The printer does not do that. I use Photoshop on my computer for editing photos before printing on this printer. I am super satisfied with this printer and use it regularly. Thank-you, Ali for taken your time to respond. I could print from the SD Card directly inserted and do my own writing as you sometimes do with this until I adhered to the rest of your advice? I guess I will need to get comfortable with my "own" handwriting this coming year. I ONLY like PENCILS are there any PENS that work as smoothly as a pencil?